Usually around the holidays breakfast is a second thought to me. 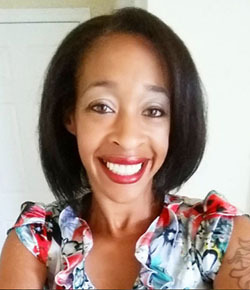 I know it’s the most important meal of the day, but with running errands, wrapping presents at crazy hours, and trying to make it to the post office it sometimes slips my mind even if I just sat my toddler down to eat. Sometimes it’s past the normal breakfast hours before I get to eat, so my breakfast turns into brunch more often than not. Now that Christmas is only two days away things are really going to get busy around here, especially if we get any out of town visitors. The worst is having to wake up and cook breakfast on top of Christmas Eve or Christmas day dinner. That’s just way too much cooking in a short period of time. Who wants to spend all day and night in the kitchen and miss out on friends and family? Not me! I think I’ve found the solution to all of my problems! A casserole! This isn’t just any plain-old casserole. Oh no! 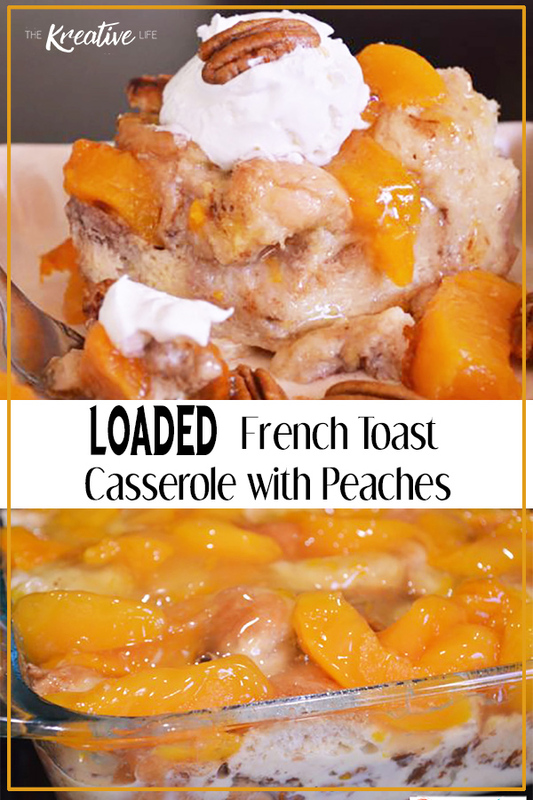 It’s a loaded French toast casserole. What do I mean by loaded? 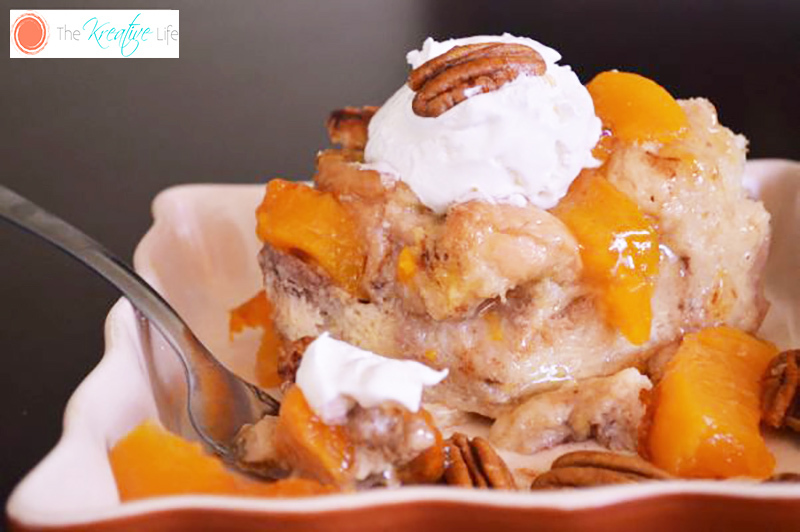 Well, it’s a loaded french toast casserole with peaches, pecans, and it’s topped with whipped cream (or you can try vanilla ice cream, if you’d like). There can be many different variations if you change the type of fruit or toppings used. However, I loved this combination. It’s easy to prepare. Just throw it in the oven and wait until your timer beeps. That’s it! It’s definitely perfect for brunch. Enjoy! Preheat oven to 350°. Spray 8×8 glass casserole dish with cooking spray. 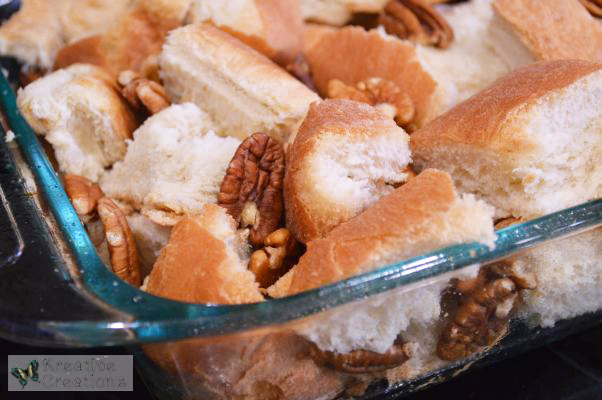 Put bread and pecans into dish and gently mix together. In a medium bowl, mix eggs, milk, sugar, 1 tsp. cinnamon, and vanilla. Evenly pour mixture over bread cubes. Evenly spread the peaches on top of the bread mixture. Sprinkle ¼ tsp. cinnamon on top. Bake for 40 minutes or until top is golden brown. Allow to slightly cool. Top with a dollop of whipped cream. If you like this loaded french toast casserole recipe, then you may want to try this bananas foster french toast! Looks tasty! Wish I would’ve seen it last night so I had time to make it. Hi, Kim! I hope you’ll find the time to make it. It’s delicious! This looks so delicious. I like how you could trade it out with different fruits probably! Thank you so much, Aimee! I bet it will taste good with other fruit. Wow, this looks AMAZING! Pinned and will try this out for a weekend breakfast treat. Thank you for the pin, Erlene! 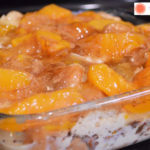 Do you drain the peaches in this recipe? Hi, Teresa! They are the peaches used for pie filling so they do not need to be drained.